What Did the Ancient Greeks Eat? The foods of ancient Greece were similar to foods we eat today but did not include many items that have become important parts of modern Greek cooking. For example, tomatoes, peppers, potatoes, and bananas didn't arrive in Greece until after the discovery of the Americas in the 15th century, because that's where those foods originated. Also, lemons, oranges, eggplant, and rice arrived later. Ancient Greeks enjoyed a varied diet of vegetables, legumes, and fruit as the mainstay. But, being a coastal country with many islands, fish and seafood were an important part of the diet and animal husbandry and hunting brought meats and game to the menu. However, the consumption of fish and meat varied in accordance with the wealth and location of the household. Typical ancient Greek meals incorporated these food items to varying degrees for breakfast, lunch, and dinner and prepared using different cooking methods to vary the appearance and taste. Ancient Greek cuisine was characterized by its frugality, reflecting agricultural hardship. 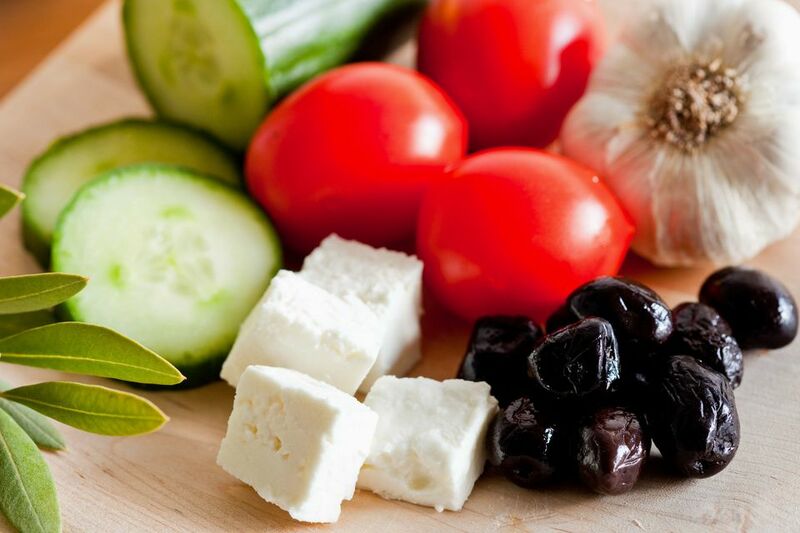 The ancient Greek diet was founded on the Mediterranean triad of wheat, olive oil, and wine and other foods reflect what was available to ancient Greeks. Several ancient Greek recipes still exist today. Vegetables were eaten as soups, boiled or mashed, seasoned with olive oil, vinegar, herbs, or garon, a type of fish sauce. And, in the cities, since vegetables were more expensive, the poorer families would consume dried vegetables and oak acorns. The main roots and tuber vegetables that were consumed included radishes, turnips, and carrots. Leafy and salad vegetables were cos lettuce (romaine), cress, arugula, and cabbage. Common bulb and stem vegetables were asparagus, cardoons (artichoke thistle), celery, fennel, garlic, and leeks. Fruit-like vegetables that were a mainstay were cucumbers and squash (marrows). Artichokes (the flower-part of the plant) and artichoke thistle (cardoons) also were popular at the time. Popular herbs and spices that came from locally grown plants at the time included coriander (cilantro), dill, mint, oregano, saffron, and thyme. Salt and pepper were common condiments used at the time. Cereals formed the staple diet. The two main grains were wheat and barley. Barley was most commonly used for bread since it was easier to grow, especially in parts of Greece that had a Mediterranean climate. Barley often was roasted before milling producing a coarse flour. Wheat grains were softened by soaking, reduced into a gruel, or ground into a flour to make flatbreads or bread loaves. Spelt was commonly used as well. Olives, which are considered a fruit, were one of the primary crops of Greece. Since the soil of Greece was generally poor, the Greeks grew grain at the bottom of the valleys and grapes and olives on the hill slopes. Olive oil was commonly used for cooking most dishes and preserved olives were a customary appetizer. Fruits, fresh or dried, and nuts were typically eaten as dessert. Important fruits were figs, raisins (grapes), and pomegranates. In the early third century A.D., the historian Athenaeus describes a dessert made of figs and broad beans in his written historical work, Deipnosophistae. Dried figs also were eaten as an appetizer or when drinking wine. It is believed that plums were among the first fruits ever domesticated by humans and it was a popular ancient fruit. Other orchard fruits consumed were apples, pears, and quinces. In general, other fruits that were available included carob (a pod from the carob tree), jujubes (red dates), and bergamot oranges, which were the first citrus fruit to make its way into Greek cuisine before lemon became a staple in modern times. Legumes would have been important crops, as their ability to replenish exhausted soil was known at least by the time of Xenophon in the fourth century B.C. As one of the first domesticated crops to be introduced to Greece, lentils are commonly found at archaeological sites in the region from the upper paleolithic period. Other popular legumes included chickpeas and green and yellow peas. Popular nuts included beechnuts, chestnuts, walnuts, and almonds. In the Greek islands and on the coast, mollusks like squid, octopus, cuttlefish, prawns, and crayfish were common. They were eaten locally but more often transported inland. Sardines and anchovies were regular fare for the citizens of Athens. Common saltwater fish were yellowfin tuna, red mullet, rays, sea bass, grouper, wrasse, swordfish, sturgeon, and eels from Lake Copais. These were delicacies usually eaten salted. The cheapest fish, sprat, were small, herring-like fish that were readily available to the ancient Greeks. Ancient Greeks consumed much less meat than is usual today. In the country, hunting and trapping allowed for the consumption of pheasant, wild hares, boar, and deer. Peasants tended farmyards with chickens, geese, and their eggs. The expression, "Don't count your chickens before they are hatched," is attributed to Aesop in 570 B.C. Slightly wealthier landowners could raise goats, pigs, lamb, sheep, and donkeys. In the city, meat was expensive except for pork. In Aristophanes' day, a piglet cost three drachmas, which was three days' wages for a public servant. Sausages were common both for the poor and the rich. The main beverages in ancient Greece were water and wine. Beer was available at the time, as it had developed in ancient Egypt about 5000 B.C. Beer and honey mead were likely reserved for ancient festivals and holidays. As the ancient Greeks domesticated farm animals, they collected milk and made cheese from it. Bees were domesticated throughout Europe by 500 A.D., but there is archeological evidence from the Minoan city on the Greek island of Crete of ancient beehives earlier than that. Vinegar has been a popular staple in Greek cuisine. In ancient Greece, around 400 B.C., Hippocrates, who is considered the father of medicine, prescribed apple-cider vinegar mixed with honey for a variety of ailments, including coughs and colds. There is archeological evidence to suggest that escargot or land snails also were consumed in prehistoric and ancient Mediterranean cultures. Slowly, foods were introduced to Greece via trade routes and explorers. The ones that thrived in the climate and soil, became a part of what makes up modern Greek cuisine. Why Nosh Hamantaschen on Purim?